The following days here in the Castor maternity hospital in Bangui have kept us busy with a steady flow of patients needed caesarean sections and other obstetric operations. I felt I was starting to get more familiar with my work, as well as my excellent team consisting of about 20 people. We have one international gynaecologist and the rest are local nurses and doctors, all of them willing to go the extra mile and learn new things. But, trouble was around the corner. A military operation was about to be launched with the objective to disarm the local militias in the nearby PK5 district of the city, and we heard that the situation there was deteriorating. People don’t stop giving birth or having complications with their pregnancy just because someone is fighting. Our hospital is situated in the neighbourhood next to PK5, so if the fighting spread we could be in the line of fire. We didn’t have to wait long. Two days later I woke up to learn that the fighting in PK5 had started. MSF responded with a medical team to assist in transporting patients with gunshot wounds from PK5 to different hospitals across Bangui. However, in our hospital, it was still mostly business as usual. People don’t stop giving birth or having complications with their pregnancy just because someone is fighting. So, the next morning, we resumed our work in the hospital, although we were still planning ahead due to the uneasy situation. The initial plan was to stabilise and transfer patients to another MSF hospital in Bangui with more capacity to treat trauma victims, or to the Red Cross (ICRC) and the local hospital. However, we were also preparing to receive gunshot patients in the hospital ourselves. I began going through our stocks in the operating theatre and trying to adjust to the idea that the situation could change any second, wondering whether we would be ready for it. Within a few days, the security situation started to deteriorate rapidly. The next morning started normally with some basic operations, but by noon we started hearing heavy machinegun fire and people were taking shelter inside the hospital. There were crowds of people sitting on the floor inside the hospital hallways. 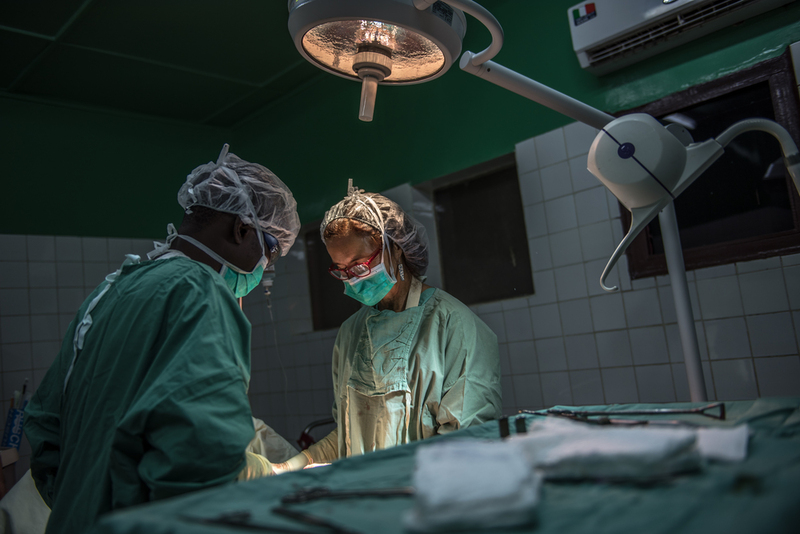 An MSF surgical team perform a caesarean section at the Castor Maternity Hospital. However, the operating theatre was the most secure place in the hospital… and to be perfectly honest, I couldn’t even hear most of the shots from there. So, in the safety of the walls of the operating theatre, we were able to continue our work quite normally – thankfully, as we still had patients who needed to be operated on. By lunchtime, the shooting was more frequent, and we had to eat our fried chicken and French fries lying on the floor. As we finished eating, the gynaecologist informed me that one of our patients, Julienne, had become tachycardic, meaning her heart rate was unusually fast. She had been suffering from an infection due to a uterine rupture and we had cleaned her wound several times with good results, but now events had taken a dramatic turn. She also had a very high blood sugar level, for reasons unknown to us. We admitted her to the recovery room for surveillance, checked her heart rate using an ECG monitor and started giving her some Intravenous fluids. We considered a referral to another hospital with more diagnostic tools. However, we decided to continue monitoring her in the recovery room as she already seemed somewhat better. The rest of the afternoon I spent stabilising and treating her in the recovery room as the fighting and shooting continued around us. But, eventually, we were told to leave the hospital due to the dangerous rising tensions and fighting. I can’t really say I was ever scared for my own safety, as I had total faith in my colleagues who performed extremely well and calm in such a stressful situation. I was only worried about the people in the hospital and I could only hope that everyone there, the patients and the staff, would be OK as well.